haha @ naughty word. One of these days I will take a break from working on your quilt and type up a post on the fair...though I did not take nearly as many photos of other people's quilts. Looking at quilts with the kids in tow is impossible. My success can be attributed to sending the kids off to the petting zoo with Dad and the grandparents. Thanks for the tour. I'm stuck at home with two sick dogs and had to miss the Northwestern Quilt Expo in Portland, my yearly treat, so my virtual trip to ABQ is a treat. 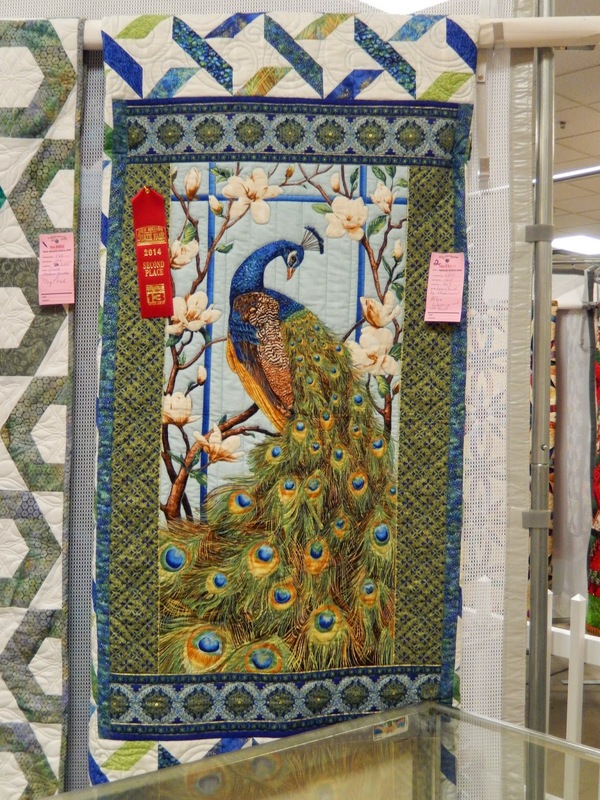 In your next post, would you tell us the theme of the NMQA challenge? I hope your dogs are feeling better, and am sorry your missed out on your yearly treat. What a disappointment! 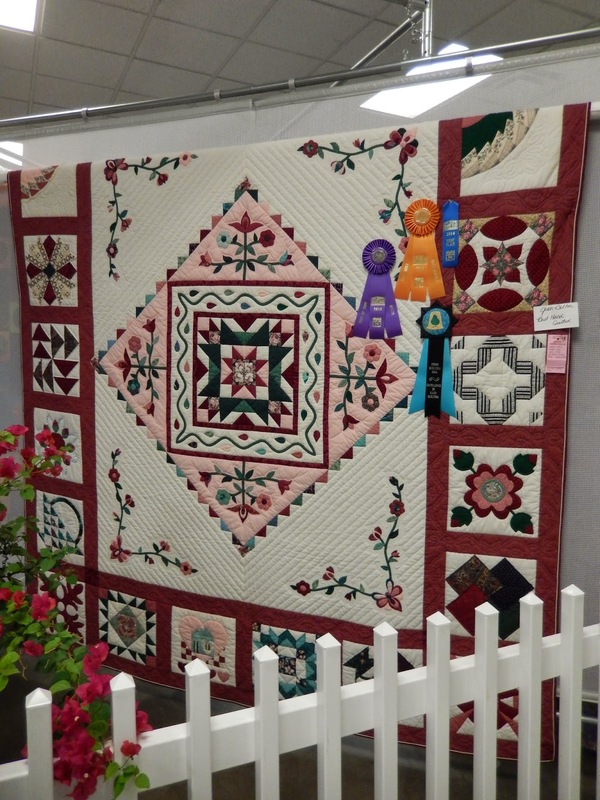 There was no particular theme, but participants were supposed to use a recognizable amount of the fat quarter they were given in a 24" x 24" quilt. The fabric this year was Patrick Lose's Mixmaster Satinesque Stripe. Different colors were provided, so the fabric doesn't look identical in each quilt. Thanks for sharing! And congrats on your wins! Looking forward to your next post! You are welcome, and thanks for the visit. 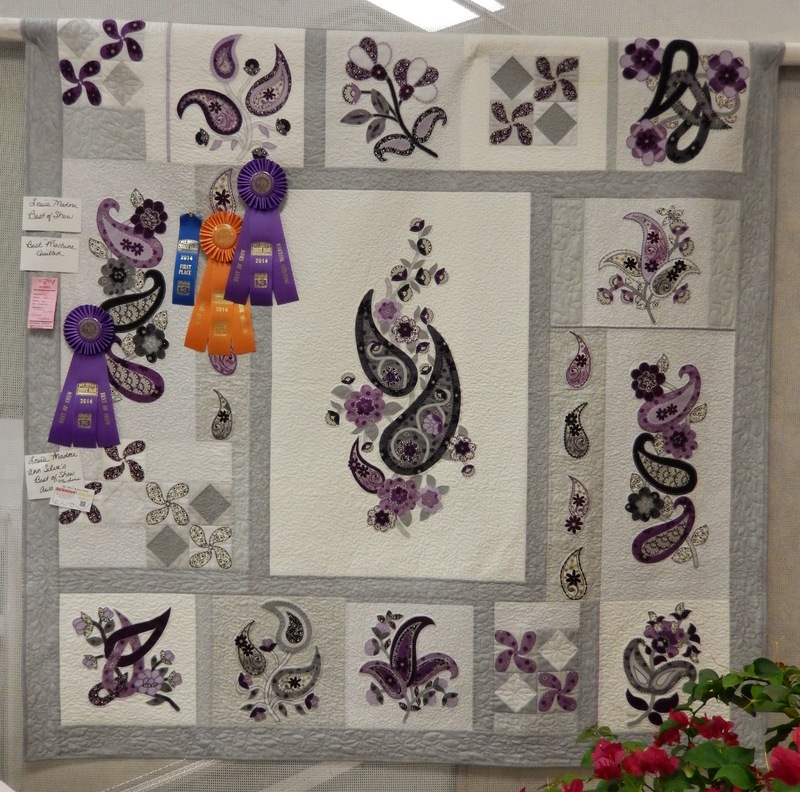 It's Debbie with the NMQA Challenge quilt. 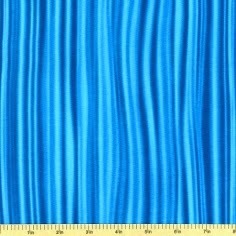 The Challenge was to use the fabric in our quilt, it's the blue stripe in the lower left. 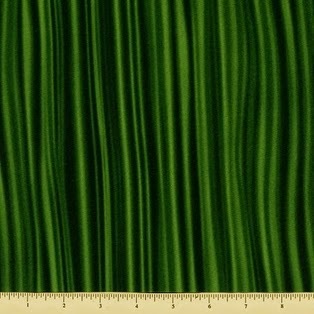 We could choose to use the blue, yellow, green or brown version of the fabric, which we purchased from our guild. We needed to use a "recognizable portion" of the fabric. I'm fairly new to modern quilting and not a big fan of solid fabrics. I can't see that would had "worked" if I had used all solids fabrics. I pieced this at a Jacquie Gering workshop last Feb. I didn't have the challenge fabric then, so I took out one of the fabrics and replaced it with the challenge fabric. I also used the fabric in a piece of the binding in the upper left side. I was delighted to have won 3rd place, as there was tough competition among the 11 entries. 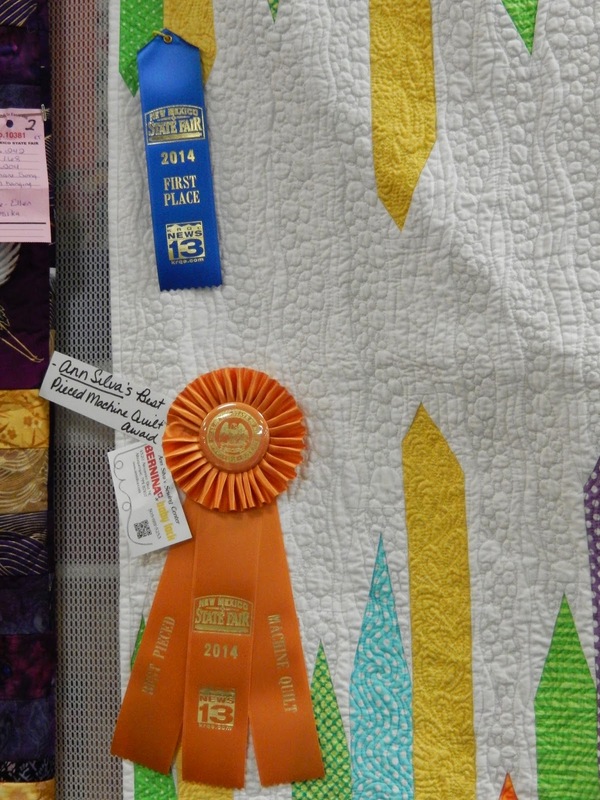 I just noticed that a piece of the challenge fabric is in the lower right of the photo of my quilt. Thanks for providing the succinct description of the challenge. Also, I must congratulate you on your excellent repurposing. I agree, the competition was stiff. That would be fun! You could join me for some butter-dreched corn on the cob and a nice stroll around the home arts building. 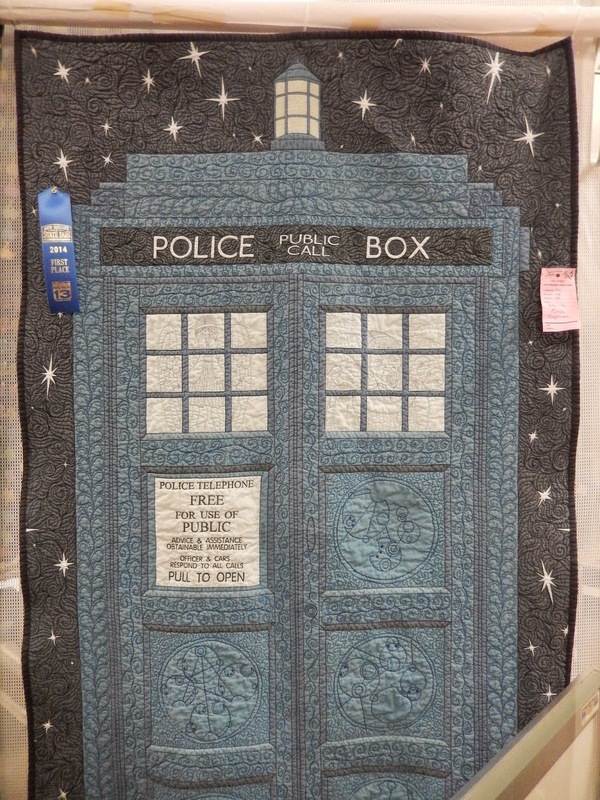 Wow, that cancer wall hanging was amazing. Thanks for sharing some of the highlights of the fair. You are welcome. I admire Renee's work, and count myself fortunate that she's local. 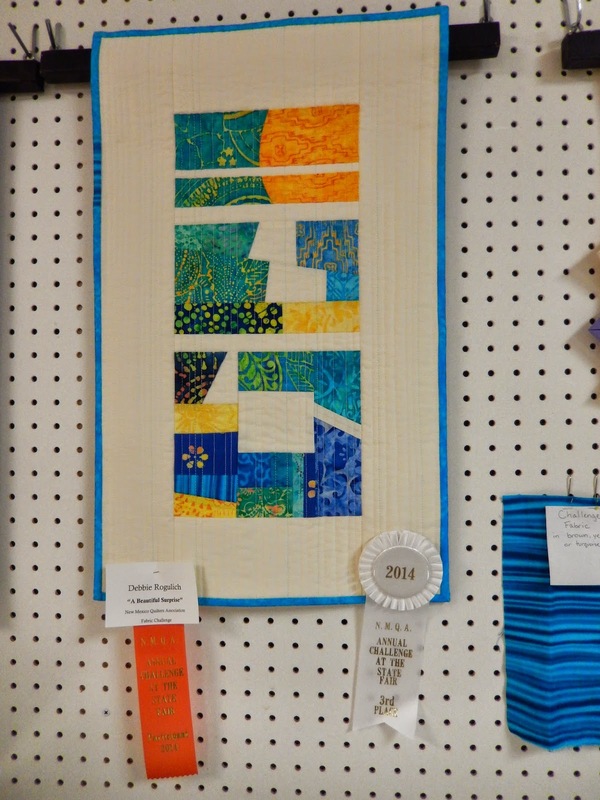 Thanks to her winning a guild membership last year for her first place at the fair, I've had the honor of getting to know her at guild meetings.